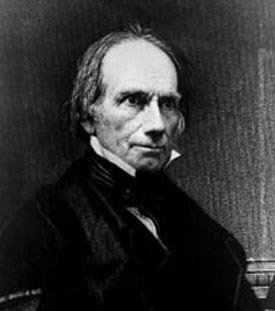 Henry Clay, Sr., was a nineteenth-century American statesman and orator who represented Kentucky in both the Senate and the House of Representatives, where he served as Speaker. He also served as Secretary of State from 1825 to 1829. He was a dominant figure in both the First and Second Party Systems. As a leading war hawk, he favored war with Britain and played a significant role in leading the nation to war in 1812 . He was a major supporter of the American System, fighting for an increase in tariffs to foster industry in the United States, the use of federal funding to build and maintain infrastructure, and a strong national bank. Dubbed the "Great Compromiser," he brokered important compromises during the Nullification Crisis and on the slavery issue, especially in 1820 and 1850, during which he was part of the "Great Triumvirate" or "Immortal Trio," along with his colleagues Daniel Webster and John C. Calhoun. He was viewed as the primary representative of Western interests in this group, and was given the names "Henry of the West" and "The Western Star." In 1957, a Senate committee chaired by Sen. John F. Kennedy named Clay as one of the five greatest Senators in U.S. history. In his early involvement in Illinois politics and as a fellow Kentucky native, Abraham Lincoln was a great admirer of Clay.